Salt Lake Community College students, staff and faculty packed a political science classroom last Wednesday to get a civics lesson from Utah’s top leader. Gov. 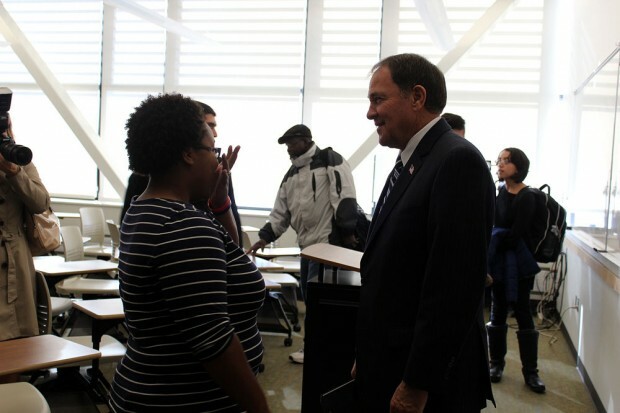 Gary Herbert visited the Taylorsville Redwood Campus to give political science students a clearer understanding of government and how to get involved. “We the people … What are you going to give back to us? If you have an issue, you first need to address it closer to home,” Herbert said to students. 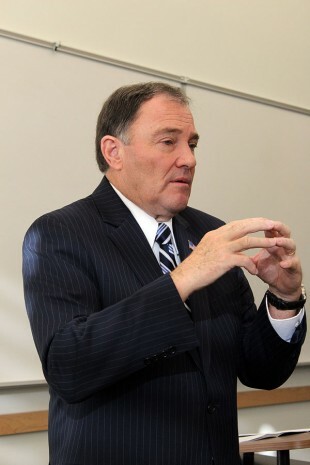 Herbert took office in August 2009 after serving five years as Utah’s Lieutenant Governor. He is known for his cornerstone approach to enhance Utah’s economy, jobs, energy, education and self-determination. He is currently Chair of the National Governors Association. SLCC President Deneece Huftalin welcomed the governor, introduced him to the audience and invited students to openly dialogue with him following his remarks. Like a seasoned political science professor, Herbert explained the basics of how the original 13 colonies were the original creators of the federal government, each with their own way of doing things. The governor stressed the importance for students to know their political history by recounting a famous quote from his ancestor. Herbert also posed tough questions to the students, such as if they are ready to understand and work through societal issues. Rather than top down, he subscribes to governments working bottom up. 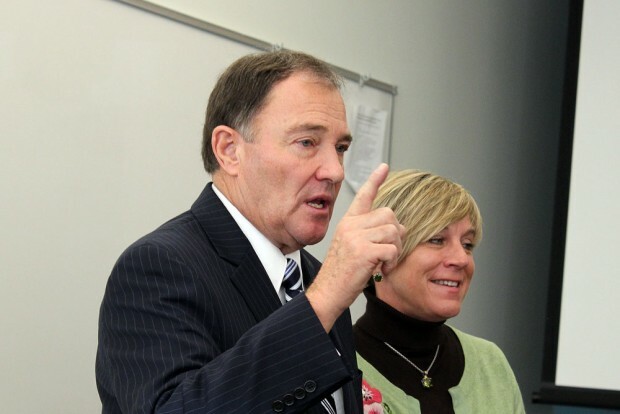 In terms of Utah’s assets, Herbert has a long list of state successes due to the constitution of Utah’s citizens and their commitment to the whole. In rapid-fire succession, the governor addressed a wide range of topics with energy, humor and vitality. His message was clear — he wants every student and citizen to get involved and to take a stake in Utah’s future. Click here to read more of what Herbert had to say to SLCC students. After the Q&A session, Herbert toured the campus with President Huftalin, which included a visit to the Student Life and Leadership office and other facilities to learn about the inner-workings of the college and student campus life.